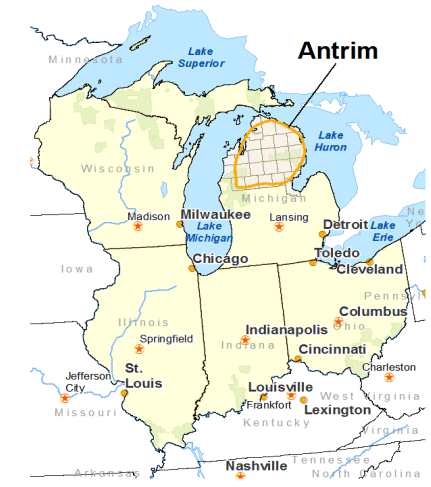 The Antrim shale gas play is located in the Michigan Basin in the northern part of Michigan State. 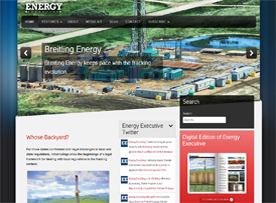 According to Red Fork Energy, the Antrim shale is the 13th largest natural gas producer in the United States. The total area of the Antrim shale play is approximately 12,000 square miles, including the developed and undeveloped areas of the play. Based upon the active area reported by Deutsche Bank, the developed area is approximately 527 square miles. Thus, the remaining area is 11,743 square miles as undeveloped area. Due to the large difference in areas of the developed and undeveloped sections, Antrim shale is being modeled as a single unit. 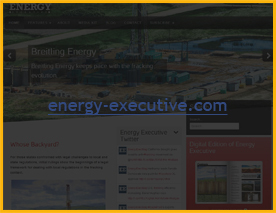 The shale gas play has an average EUR of 0.28 Bcf per well and approximately 19.9 Tcf of technically recoverable gas. Antrim ranges from 600 to 2,200 feet deep and is 70 to 120 feet thick. Other average properties were estimated for the Antrim shale play. These estimates are depth (1,400 ft.), thickness (95 ft.), porosity (9%), and total organic content (11%). In 2008, there were 4 companies holding leases in the Antrim shale play. Based upon these lease holdings, the total active area is calculated at 337,085 net acres (527 square miles). Antrim shale activity began in 1980 with 9,000 completed wells as of 2008. In 2008, Deutsche Bank estimated an average well cost for the Antrim shale play ranging from $0.3 to $0.5 million dollars.